Have you heard of Onkalo, the underground nuclear waste storage facility being built in Finland? You can now. 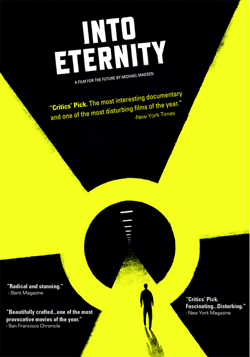 A wonderful new documentary called Into Eternity takes us into the depths of this eerie place meant to hold all of Finland’s nuclear waste and never be disturbed. Good solutions for our long-lived radioactive contaminants are hard to come by. We mostly try to put them in containers that will hold them for a long time somewhere hard to access. Director Michael Madsen interviews a variety of people involved with Onkalo to find out how they are wrestling with the nuclear waste dilemma. They are taking the rare long-view, embarking on a project that will take a hundred years to finish. Scenes from the film take you deep underground where workers are dependent on headlamps and flares to blast tunnels further and further into the earth. One of the more intriguing problems is how to keep future people away from contaminants that will be dangerous for hundreds of thousands of years. There seem to be two sides. The elaborate warning system using multiple languages and hieroglyphs to warn future peoples that “this place should not be disturbed, death awaits.” And the leave no marker, hide it so no one can find it approach. It is hard to imagine what intelligent life will be like thousands of years from now. My only experienced reference point for time-travel is standing in the Pantheon, an awe inspiring religious gathering place that has been in continuous use since 126 AD. The architectural genius that created the Pantheon is long gone. No one knows how to build a perfect structure like this, we have forgotten. In 2,000 years we have forgotten. And remember, Plutonium-239 is dangerous for 240,000 years. It is sobering to think about how to keep our nuclear waste legacy alive to warn future humans. We forget so easily, now more than ever, as we rely so heavily on easily accessible information. At Hanford the conversation is about “long-term stewardship” and making sure people stay away from the 10 square mile area (affectionately called “the sacrifice zone”) at the center of the site where DOE plans to leave nuclear waste forever. Forever is a long time. Not so long ago, the Hanford Site was the bottom of a lake.